Many thanks to The National Save The Sea Turtle Foundation for providing four senior-year undergraduate scholarships during the 2019-2020 academic year. The scholarships will provide financial assistance to Charles E. Schmidt College of Science seniors enrolled at the Boca Raton Campus who demonstrate academic excellence, financial need, and a commitment to become scholars and ambassadors that represent the Marine Science program at Florida Atlantic University. 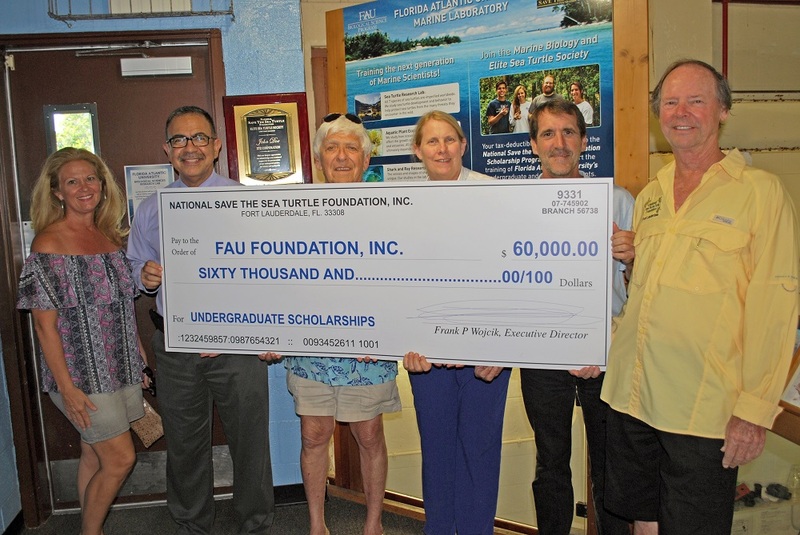 The National Save The Sea Turtle Foundation has donated $60,000 to Florida Atlantic University in support of four $15,000 undergraduate scholarships during the 2019-2020 academic year. The scholarships will provide financial assistance to Charles E. Schmidt College of Science seniors enrolled at the Boca Raton Campus who demonstrate academic excellence, financial need, and a commitment to become scholars and ambassadors that represent the Marine Science program at Florida Atlantic University. As such, they are expected to develop as well-rounded, skilled, and committed individuals who are motivated to engage the public through education, research, and outreach activities appropriate to both their specific interests in the field, as well as those of importance in the field of marine biology.